D1 SSD | DREVO :: Game With Cool Tech. 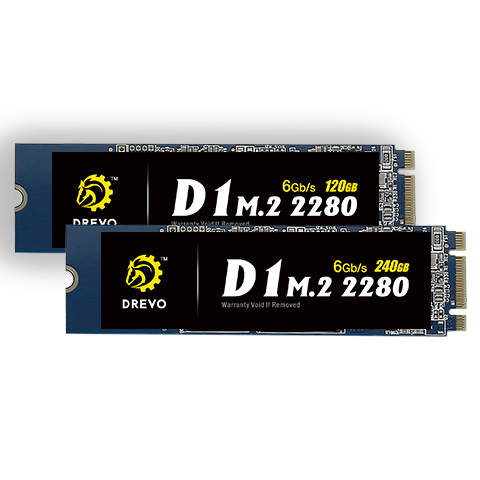 Featuring M.2 2280 form factor, the D1 SSD is for the use in small devices such as ultrabooks or tablets. Powered by the latest controller and flash, the D1 SSD is able to provide incredible speeds. Reliable Performance: Accelerated by the newest technology, the D1 could beat down any heavy task and loading. Noticeable Efficiency: Operates 10 times faster than a typical hard disk drive with much lower power consumption. Rendering Enjoyments: Works with no audible noise and cooler in a laptop with its M.2 2280 interface.